Gold and silver futures finished slightly lower Thursday. PGM’s ended divided with platinum soaring 3.5% and palladium dropping 3.3%. Gold’s modest loss was its second in a row. Gold for June delivery declined $1, or nearly 0.1%, to settle at $1,294.30 an ounce on the Comex division of the New York Mercantile Exchange. 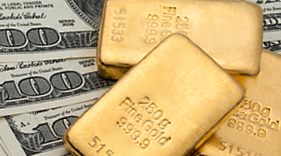 "Even though we had a favorable backdrop being created by a more dovish U.S. Federal Reserve, gold is following the dollar, real yields and equities very closely at the moment," Reuters quoted Suki Cooper, precious metals analyst at Standard Chartered Bank. "But still, the broader backdrop is supportive for gold and we expect the dollar to weaken more in the second half of the year," Cooper added. Gold futures traded from a low of $1,284.90 to a high of $1,298.70. They lost less than 0.1% on Wednesday, gained less than 0.1% on Tuesday, and fell 0.3% on Monday — ending at their lowest point since March 11. Silver for May delivery fell 1.8 cents, or 0.1%, to settle at $15.084 an ounce. Silver futures ranged from $14.86 to $15.15. They rose 0.3% on Wednesday, declined 0.3% on Tuesday and lost less than 0.1% on Monday. Last Thursday, prices settled at $14.973 an ounce for their worst close since Dec. 24. July platinum advanced $30.30 to $904.50 an ounce, trading between $873.30 and $904.80. Palladium for June delivery plunged $45.80 to $1,332.30 an ounce, ranging from $1,329.40 to $1,383.90. Gold declined $7.30, or 0.6%, to $1,283.15 an ounce. Silver declined 8 cents, or 0.5%, to $15.085 an ounce.